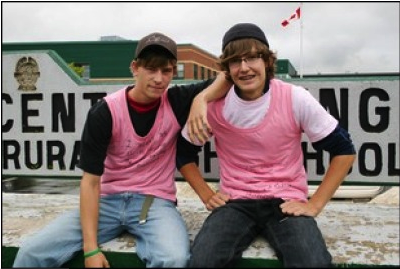 Two students at a Nova Scotia high school organized a pink shirt campaign to support those who have been bullied. Pink shirts were chosen because a 9th grade student was bullied for wearing a pink polo shirt at school. Over 50 pink t-shirts were passed out at the school. The pink shirt bully campaign spread throughout Canada, the U.S. and Japan and as a result Nova Scotia Premier Rodney MacDonald declared the second Thursday of each school year in his province as Stand Up Against Bullying Day. The result of the campaign was that some bullies left the school and others were expelled for incidents that occurred following the start of the campaign. One bully defecated on a students car, left a dead mouse being stuffed into the vent of a car, and threats of physical violence. The students hope their pink t-shirt and actions will result in less bullying. One student said “We know we can’t demolish bullying, but we can teach kids to stand up and not accept situations.” Read more about it in the Sudbury Star. Anyone who witnesses bullying can report bullying online at www.bullyhelp.org, which allows people to report incidents and then the web site staff will contact school staff. Also check out Christy Clark’s Wear Pink bullying site.